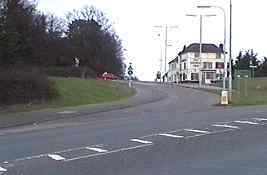 A small cave, which has now been back filled, was at the top of the old A3 near 'The George Inn'. There is an area of open land there which was once the location of Jones' Tea Shop. It is shown on an ordnance survey map of 1870. It was demolished in the early 1940s when the site was taken over by the Portsmouth Home Guard so as to protect the most important road out of Portsmouth which would have been blown up in the event of a German invasion. In the cliff face at the back of the shop was a small cave which was used as a pantry. I suspect though that the cave's history pre-dates the Tea Shop.mn in the middle. The cave depth was about 20 feet. 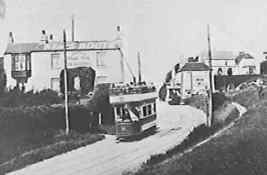 Jones' tea shop is on the left of this old photo, and The George Inn - formerly Milestone Cottage - is on the right. The roof of the tea shop has the words "KENS BOOTS" written on it. Perhaps he was a Pompey supporter. The George Inn now stands alone. The caves are in the undergrowth on the extreme left of the photo. There used to be a long barrow to the right of the George, which was destroyed by road works. 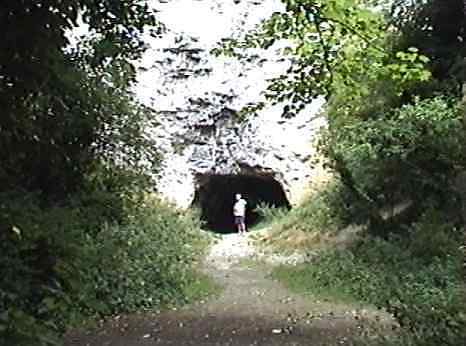 The cave entrance, now back filled and much overgrown. out on the same level to the right . The central column is between the two entrances, which link up in a U shape. The tea gardens around 1905 looking south west. The caves are probably behind the building on the right. Just a short walk down the hill from the site above, is a wooded area in which there is an old disused quarry called Candy's pit. This name has several origins. One story goes that a tramp turned up at the tea shop (see above) one day accompanied by a brown bear cub. The bear remained there, and as it grew up learnt to juggle and dance - it was named Candy, and lived for so long that the pit was eventually named after it. It lived so long in fact that it outlasted the tea shop, and was fed by troops during WWI. A less interesting explanation, and therefore probably the correct one, is that a Miss Candy lived in a cottage in the pit some time prior to 1930. There is a small cave at the back of the pit, the exact origin of which is not known, although one theory is that it was cut by Napoleonic French POWs quartered at Portchester Castle, and who were used as labourers here. Miss Candy had used it as a store room for fruit, and after 1930 the next tenants used it as a coal store and motorbike shed. During WWII these same tenants erected a wooden shed inside the cave, fitted it out with home comforts including lighting and cooking facilities, and then used it as an air-raid shelter. When the London Road Tunnel Shelter, which is a few hundred yards south of here became full, they sometimes experienced gatecrashers. Most had to be turned away but one couple whom they took pity on installed themselves on deckchairs outside the shed, but still in the cave. Later they erected a tent over the deckchairs and spent every night for the next 3 years asleep under it. nature trail. Careful inspection around the pit reveals traces of 20th Century occupation. 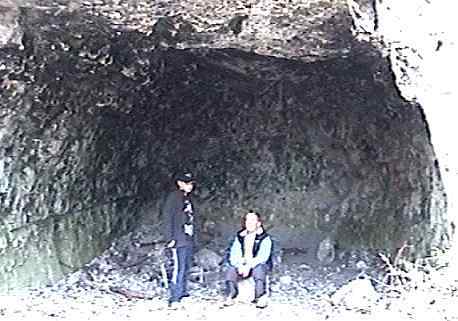 The cave is 15 feet wide, and 20 feet deep. It was cut by hand using picks. It is still in use today, as there is plenty of evidence around of modern day partying! 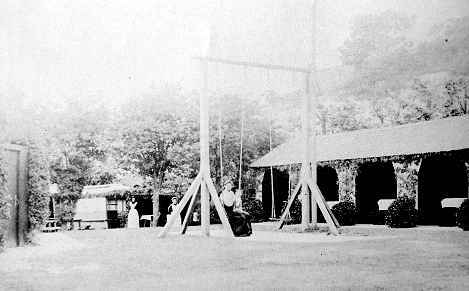 Candy's Pit 1916. The cave entrance shown in the previous photo is in between the arms of the cliff - lower centre. In the background is the teashop. 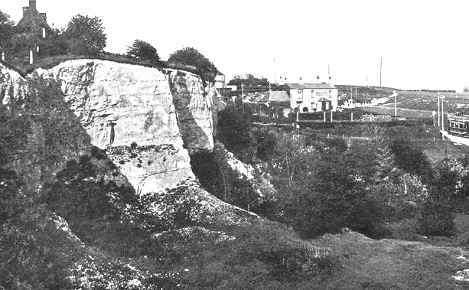 On top of the cliffs on the extreme left is Cliffdene Cottage which was demolished in the 1980s. On the extreme East of Portsdown Hill Road at Bedhampton, there were some brick lined vaults or cellars cut into the side of a disused chalk quarry. It is said that they were probably associated with 'The Crown' public house which is marked on an OS 1870 map. During WWII the quarry was used as a depot for armoured fighting vehicles on the run up to D-Day, and after the war it was used as a War Department scrapyard. Today the site houses a small retail park, and the vaults are more or less lost. A map of 1870 showing the Crown Public House (arrowed) and the Bedhampton Chalk Pit. 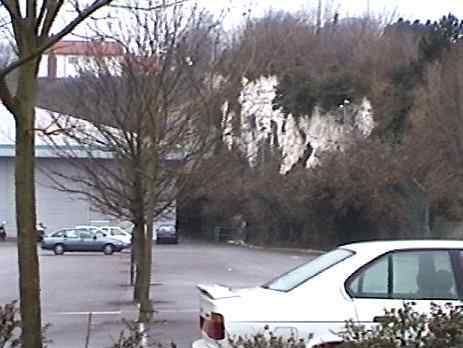 This small quarry, now a retail park, contains the Bedhampton vaults. The entrance is now overgrown and very dangerous due to rock falls.